ترابی, کیوان, شریعتی نیا, مصطفی, حیدری رارانی, محمد. (1395). بررسی تئوری و تجربی تاثیرات تورق بر پارامترهای ارتعاشی تیر کامپوزیتی متعامد متقارن. علوم و فناوری کامپوزیت, 3(2), 177-186. کیوان ترابی; مصطفی شریعتی نیا; محمد حیدری رارانی. "بررسی تئوری و تجربی تاثیرات تورق بر پارامترهای ارتعاشی تیر کامپوزیتی متعامد متقارن". علوم و فناوری کامپوزیت, 3, 2, 1395, 177-186. ترابی, کیوان, شریعتی نیا, مصطفی, حیدری رارانی, محمد. (1395). 'بررسی تئوری و تجربی تاثیرات تورق بر پارامترهای ارتعاشی تیر کامپوزیتی متعامد متقارن', علوم و فناوری کامپوزیت, 3(2), pp. 177-186. ترابی, کیوان, شریعتی نیا, مصطفی, حیدری رارانی, محمد. بررسی تئوری و تجربی تاثیرات تورق بر پارامترهای ارتعاشی تیر کامپوزیتی متعامد متقارن. علوم و فناوری کامپوزیت, 1395; 3(2): 177-186. در این پژوهش، تاثیر اندازه و موقعیت تورق بر پارامترهای ارتعاشی تیر کامپوزیتی متعامد متقارن چندلایه به روش‌های تحلیلی، اجزای محدود و تجربی ارایه شده است. در روش تحلیلی، تیر متورق به چهار زیرتیر تقسیم شده و دو مدل مود آزاد و مقید برای مدل‌سازی تداخل دو زیرتیر در محل تورق در نظر گرفته شده است. همچنین اثرات وابستگی کشش-خمش به‌دلیل تقسیم تیر به زیرتیرهای نامتقارن لحاظ شده است. 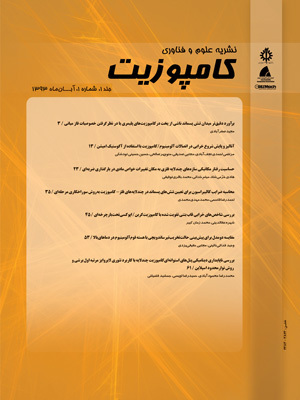 در روش اجزای محدود، تیر کامپوزیتی با اندازه و موقعیت‌های مختلف تورق در نرم‌افزار اجزای محدود آباکوس شبیه‌سازی و فرکانس‌های طبیعی و شکل‌مودها از تحلیل مودال به‌دست آمده است. دو مدل مود آزاد و مقید با درنظرگرفتن شرایط مرزی، قیود، غیرخطی‌ها، شرایط تماسی و المان‌های مناسب شبیه‌سازی شده است. نتایج عددی دو مدل مود آزاد و مقید از هر دو روش تئوری برای تیر کامپوزیتی متعامد متقارن دارای تورق با اندازه و موقعیت‌های مختلف ارایه و مقایسه می‌شود. همچنین به‌منظور بررسی تاثیرات موقعیت طولی تورق‌های نسبتا کوچک بر سه فرکانس اول، پس از ساخت نمونه‌های کامپوزیت، آزمون‌های تجربی آنالیز مودال انجام و برای شرایط مرزی مختلف، فرکانس‌های طبیعی استخراج می‌شود. نتایج حاصل نشان می‌دهد که فرکانس‌های تحلیلی، اجزای محدود و تجربی تطابق خوبی با یکدیگر دارند. In this study, the effects of delamination size and location on vibration characteristics of laminated composite beams are investigated via analytical, finite element and experimental methods. In the analytical method, the delaminated beam is divided into four interconnected beams and the interaction of two sub-beams at the location of delamination is simulated by both constrained and free mode models. The effect of bending-extension coupling is taken into account in the analytical formulation. In finite element method, modal analysis is performed on the delaminated composite beams with different delamination sizes and locations and various boundary conditions using commercial finite element software, ABAQUS. Both free and constrained mode models are simulated in the finite element model using suitable interactions, nonlinearities and friction conditions. Analytical and finite element results of both constrained and free mode models are compared for a symmetric cross-ply delaminated composite beam with various sizes and locations of delamination. Also, in order to investigate the effects of axial location of relatively small delamination on the first three natural frequencies, modal tests are done on glass/epoxy composites for various boundary conditions. Results show that analytical, finite element and experimental frequencies have good agreement with each other. Zou, Y. Tong, L. and Steven, G.P., "Vibration-Based Model-Dependent Damage (Delamination) Identification And Health Monitoring For Composite Structures- A Review," Journal of Sound and Vibration, Vol. 230, No. 2, pp. 357-378, 2000. Ramkumar, R.L. Kulkarni, S.V. and Pipes, R.B., "Free Vibration Frequencies Of A Delaminated Beam," In: Reinforced plastics/composites institute, 34th annual technical conference, Vol. 22, pp. 1-5, 1979. Wang, J.T.S. Liu, Y.Y. and Gibby, J.A., "Vibration Of Split Beams," Journal of Sound and Vibrations, Vol. 84, No. 4, pp. 491-502, 1982. Mujumdar, P.M. and Suryanarayan, S., "Flexural Vibrations Of Beams With Delaminations," Journal of Sound and Vibrations, Vol. 125, No. 3, pp. 441-461, 1988. Tracy, J.J. and Pardoen, G.C., "Effect Of Delamination On The Natural Frequencies Of Composite Laminates," Journal of Composite Materials, Vol. 23, pp. 1200-1215, 1989. Shen, M.H.H. and Grady, J.E., "Free Vibration Of Delaminated Beams," AIAA Journal, Vol. 30, pp. 1361-1370, 1992. Saravanos, D.A. and Hopkins, D.A., "Effects Of Delaminations On The Damped Dynamic Characteristic Of Composite Laminates: Analysis And Experiments," Journal of Sound and Vibration, Vol. 195, pp. 977-993, 1996. Lee, J., "Free Vibration Analysis Of Delaminated Composite Beams," Journal of Computers and Structures, Vol. 74, pp. 121-129, 2000. Luo, H. and Hanagud, S., "Dynamics Of Delaminated Beams," International Journal of Solids and Structures, Vol. 37, No. 10, pp. 1501–1519, 2000. Wang, J. and Tong, L., "A Study Of The Vibration Of Delaminated Beams Using A Nonlinear Anti-Interpenetration Constraint Model," Journal of Composite Structures, Vol. 57, pp. 483–488, 2002. Ramtekkar, G.S. Desai, Y.M. and Shah, A.H., "Natural Vibrations Of Laminated Composite Beams By Using Mixed Finite Element," Journal of Sound and Vibration, Vol. 257, No. 4, pp. 635–651, 2002. Perel, V.Y. and Palazotto, A.N., "A Nonlinear Model Of Composite Delaminated Beam With Piezoelectric Actuator With Account Of Nonpenetration Constraint For The Delamination Crack Faces," Nonlinear Dynamics and Systems Theory, Vol. 4, No. 2, pp. 161–194, 2004. Della, C.N. Shu, D. and Rao, P.M.S., "Vibrations Of Beams With Two Overlapping Delaminations," Journal of Composite Structures, Vol. 66, pp. 101–108, 2004. Shu, D. and Della, C.N., "Free Vibration Analysis Of Composite Beams With Two Non-Overlapping Delaminations," International Journal of Mechanical Sciences, Vol. 46, pp. 509–526, 2004. Shu, D. and Della,C.N. "Vibrations Of Multiple Delaminated Beams," Journal of Composite Structures, Vol. 64, pp. 467–477, 2004. Della, C.N. and Shu, D., "Vibration Of Delaminated Composite Laminates: A Review," ASME, Vol. 60, 2007. Ramtekkar, G.S., "Free Vibration Analysis Of Delaminated Beams Using Mixed Finite Element Model," Journal of Sound and Vibration, Vol. 328, pp. 428–440, 2009. Qiao, P. and Chen, F., "On The Improved Dynamic Analysis Of Delaminated Beams," Journal of Sound and Vibration, Vol. 331, pp. 1143–1163, 2012. Manoach, E. Warminski, J. Mitura, A. and Samborski, S., "Dynamics Of A Composite Timoshenko Beam With Delamination," Mechanics Research Communications, Vol. 46, pp. 47– 53, 2012. Liu, Y. and Shu, D.W., "Free Vibration Analysis Of Rotating Timoshenko Beams With Multiple Delaminations," Journal of Composites: Part B, Vol. 44, pp. 733–739, 2013. Keshava Kumar, S. Ganguli, R. and Harursampath, D., "Partial Delamination Modeling In Composite Beams Using A Finite Element Method," Finite Elements in Analysis and Design, Vol. 76, pp. 1–12, 2013. Senthil, K. Arockiarajan, A. Palaninathan, R. Santhosh, B. and Usha, K.M., "Defects In Composite Structures; Its Effects And Prediction Methods- A Comprehensive Review," Composite Structures, Vol. 106, pp. 139–149, 2013. Shariati-Nia, M. Torabi, K. and Heidari-Rarani, M., "Free Vibration Analysis Of A Composite Beam With Single Delamination- An Improved Free And Constrained Model," Engineering Solid Mechanics, Vol. 2, pp. 313-320, 2014. Torabi, K. Shariati-Nia, M. and Heidari-Rarani, M., "Modal Characteristics Of Composite Beams With Single Delamination- A Simple Analytical Technique," Mechanics of Advanced Composite Structures, Vol. 2, pp. 97-106, 2014. Thalapil, J. and Maiti, S.K., "Detection Of Longitudinal Cracks In Long And Short Beams Using Changes In Natural Frequencies," International Journal of Mechanical Sciences, Vol. 83, pp. 38–47, 2014. Standard Test Method for Tensile Properties of Polymer Matrix Composite Materials, Annual Book of ASTM Standard, D 3039, 2002. Shen, M.H.H. and Pierre, C., "Natural Modes Of Bernoulli-Euler Beams With Symmetric Cracks," Journal of Sound and Vibration, Vol. 138, No. 1, pp. 115-134, 1990. Shen, M.H.H. and Pierre, C., "Free Vibrations Of Beams With A Single-Edge Crack," Journal of Sound and Vibration, Vol. 170, No. 2, pp. 237-259, 1994. Torabi, K. Jafarzadeh Jazi, A. and Zafari, E., "Exact Closed Form Solution For The Analysis Of The Transverse Vibration Modes Of A Timoshenko Beam With Multiple Concentrated Masses," Applied Mathematics and Computation, Vol. 238, pp. 342-357, 2014.